Great paddle, I strongly recommend. Simple as that. Can't say enough good things about the folks over at Werner. Truly well crafted paddle, even lighter than I anticipated and fatigue at the end of a long paddle isn't even something on my mind anymore. If you're looking into upgrading from an entry level paddle this is the next step. Terrific paddle!!! It's strong but also very lightweight. The lightness makes a day of paddling much more enjoyable. I don't feel arm weary so the paddles are longer and more fun. I highly recommend this product. Great paddle! I have been using it for sea kayaking; I strongly recommend. Light and strong. Knifes into water and provides great support as well as propulsion. Excellent, lightweight paddle. What was even more excellent was the customer service when my paddle arrived broken. Probably the best customer service I have ever received anywhere, ever. I had a replacement sent back to me in no time at all, at no extra cost to me. Thanks ACK! Started kayaking five months ago with a BB Angler which worked just fine; but is quite heavy after a few hours. The Camano however is a joy to use; very light in comparison, blades that do not flex and easy to paddle for hours on end. Next will be a bent shaft to see if I like those better. Worth every penny. Bought tandem kayak to take friends out. Came with some really heavy paddles. I was spoilt with my Werner paddles. Still need one more. Great paddle. Very lightweight which helps avoid upper-arm and shoulder pain during long- duration trips. A pleasure to use and performs very well. Nice angle adjustment feature too. This is a very good mid price paddle, especially if you get it on sale. Light enough, tough enough. I bought the 240 length for a fishing kayak that is wider than my other boats. This is the fourth Werner paddle I have purchased and I have been happy with them all. As I was looking to upgrade paddles for the MR 340, I had a hard time making a decision as most reviews I found seemed useless as the reviewer stated, "Worked great for an all day, 18 mile paddle!" That's cute. But I needed to paddle 18 miles before breakfast. Any attempt to find an appropriate paddle would have to be a leap of faith on my part and I jumped with the Camano. So I told myself that when I completed the MR 340, I would leave a reivew for this paddle. I just completed the race and I have to say that this paddle worked great! It is an excellent value as a mid-price paddle. For me, spending twice as much to shave off 3-4 additional ounces just didn't seem worth the extra cash. The blades have held up from hitting driftwood several times in the middle of the night too. If you're like me and aren't willing to pay top dollar for everything, take a good look at this paddle. If it works great for a 340 mile around-the- clock race, it will be awesome on normal, relaxing paddles. Love this paddle! Spent some time with Travis while in Austin to go through paddle characteristics and physics. The Camano came up as the best compromise between performance and cost. Sure, there are cheaper paddles, but they come at the cost of performance. This one pushes the Ride 115 well, and I can cover a lot of water with no fatigue issues. There is a lot of bang for the buck with this paddle, and it is worth the cost in my book. Great paddle!! It has increased my range considerably from the heavier paddle that I had before. It is also a very efficient paddle. Very nice comfortable paddle and lightweight. Excellent lightweight paddle. Not noisy entering the water - important when watching for wildlife. I miss the right-hand raised portion on the shaft that my old Werner paddle has. I ordered the Camano to replace the Werner Skagit CF. The Camano is lighter and very easy to handle. Looks great too! Its nice although pricey. Lightweight yet very durable. High quality and I really like the way you put it together rather than with a push pin. In spite of the price, Id buy it again. Paddle was not that much lighter than my Aqua Bound, but still very satisfied. I like the feathering, which the other paddle didnt have and love the look of the red paddle. Received it super quick, half way around the world in Australia. As described. Quick, no hassle purchase. Paddle is awesome! Love these paddles. If given the choice between a new boat or new paddles... I think I'd pick the paddles. These made a HUGE difference over the standard fiberglass/nylon Carlisle paddles I had before. Great paddle so far in the inter-coastal here. I found the Camanos to be very light compared to my previous paddles. I loved the way they felt in the water and do think they are less fatiguing. The adjustments for feathering are precise, easy to read and do. Glad I bought them. A few weeks back I bought two sets of Werner Camano Fiberglass Straight Shaft Paddles, one for my son and another for myself. Now that we have put quite a few hours and a lot of miles paddling around the Maltese Islands,I can say that buying this paddle was the right choice. The currents in the Mediterranean Sea can be very strong, but with the Camano, we hardly got tired and finished our tours in total relexation. 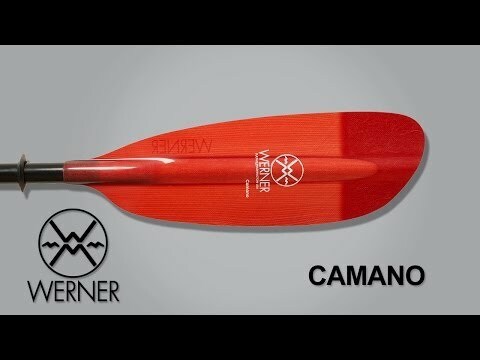 The Werner Camano Fiberglass Straight Shaft Paddle could be lighter, but it is very comfortable and balanced. I found it very natural to use and the paddle did its job, well. It was a good choice for me! Q: Do you carry the skinny (small) shaft versions as well? Werner's website says they make them but I don't see any differentiation on here. A: We do not stock them, but we can special order one for you! If you are interested in doing this please give us a call at 888-828-3828.